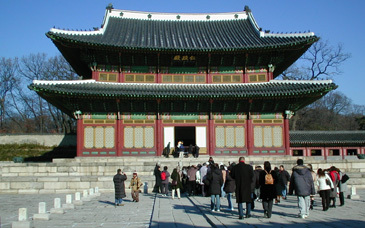 A host of Japanese tourists visit Changdeok Palace in Seoul. Local inbound market is suffering immensely due to drastic decrease of seasonal Japanese tourists against the backdrop of chilling bilateral relations caused by the controversial Japanese school textbook and Dokdo issue. Most Japanese tourists now refrain from making seasonal trips to Korea and China, a time described as "Gold weeks of May" from April 27 to May 7 for fear of prospective violence from anti-Japanese demonstrations in China and Korea. According to a recent survey conducted by JTB, the largest travel agent of Japan, some 602,000 Japanese were expected to make overseas trips during the seasonal holidays, more than 564,000 registered in the year 2000 which was so far the record high for the so called "Gold weeks" overseas travel boom figure. 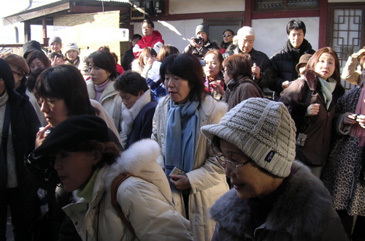 Numerous Japanese women flock to a drama house of a famous movie star Bae Yong-Jun in Chuncheon in Gwangwon Province. The South Korean melo drama "Winter Sonata" in which Bae starred hit the Japanese market hard, attracting a stream of Japanese tourists to Korea. To the frustration of tour operators here, however, the number of visitor arrivals from Japan, Korea's largest inbound market, has decreased by 20 to 50 percent so far, according to travel agents. It was earlier expected that Korea would suffer less than China because of there was no serious and violent anti-Japan demonstration here yet. The situation is much worse than expected, however. For May, the number of incoming Japanese tourists here is expected to decrease by 40 percent from the same period a year ago, according to Hanjin Travel Service officials. "Japanese Gold Week boom is gone," said a travel agent and expressed concern about possible inbound market slump in months ahead. If this situation continues, the number of Japanese tourist arrivals here is expected to decrease further in June and July, he added.